Just before Christmas we finished a few new tracks, "Breathe" being one of them! There are also 3 remixes of "Breathe" made by keyboardwiz Johan. No release date is yet set, but plans are to release an EP and digitally on iTunes. Well, time flies and we realized the bio was not up to date. That is corrected now though. It's amazing to look back and think of all the shows and people we met. Can't wait to get out and play soon! We had a blast playing the Fjardafestival in the Faroe Islands! What an awesome place, it's unlike any place we ever visited. And we met some great people too! Check out the pics for that and also we have pics from Poland, earlier this summer. Go to the photo galleries. 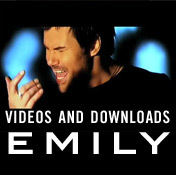 The full "Emily" EP is now available worldwide on iTunes. The digital EP contains the Eurovision version plus two remixes and a karaoke version.